Traditional craftsmanship, and attention to detail. Handmade in Germany by Kosen using the finest materials. For 100 years toys have been produced in Bad Kösen, a small resort town on the Saale River in Germany. Käthe Kruse founded the company in 1911/12 as a doll making workshop. The first plush animals were presented at the Leipzig Trade Fair in 1958. Kösen plush animals are distinguished by highly naturalistic and expressive design, by their immediate appeal as toys and by their quality of material and craftsmanship. Each design is based in intensive studies of the anatomy and movement of the animal depicted. Kösen designers draw the animals in their natural habitats or in zoos and create them as three dimensional models from clay. The toy animals are always presented in the typical and natural position. Important details are lovingly executed, and especially the faces receive a very lifelike expression. In order to achieve this, Kösen uses varied materials including only the best quality plush fur. The animals are assembled from up to seventy individual elements, sewn together, turned inside out, filled with high quality fibres, stitched closed, combed and brushed, embroidered and painted - all by hand and exclusively at Bad Kösen. 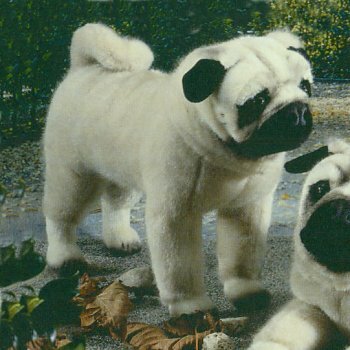 Kösen plush animals are made in Germany with materials from Europe. All meet European safety norms and carry the CE mark. All animals can be surface washed at 30°C. A cuddly toy animal from Kösen is a valuable present for children and for adults who love nature and wildlife. See more of our Kosen Plush . . .